OUR PRICES ARE FULLY INCLUSIVE - NO HIDDEN EXTRAS! 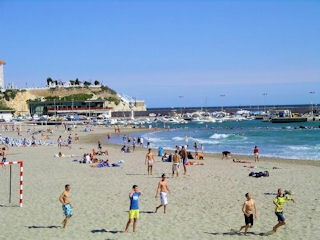 Brand new family holiday letting, Costa Blanca, Spain. This 4 bedroom, 3 bathroom, family holiday letting in urbanisation Balcón de Finestrat is located between lively Benidorm and the beautiful town of Finestrat nestled in the mountains. The villa sleeps 8 comfortably with: 2 double bedrooms, 1 twin bedroom plus large underbuild that can be used as 4th bedroom at night (with 2 double sofa beds) and a TV/Games room during the day. The holiday villa also has a fully equipped kitchen (including washing machine), air-conditioned living / dining room, large front & rear gardens including car parking space (for up to 3 cars). There's also 3 private patio/terrace areas for sunbathing, relaxing or al-fresco eating and a large shared swimming pool right outside your door! The holiday villa is ideally located for the peace and tranquillity of the mountains yet is close enough to Benidorm with all its attractions. Terra-Mitica amusement park, Terra-Natura nature park, Water parks, Golf, Go-Karts, and lots more. The Benidorm area has its own all year round micro-climate giving very mild winters and lots of beautiful sunshine in the summer, with pleasant breezes to prevent you from over-heating on the beach.